In the heart of Siracusa's country-side there is the house,located between Floridia town and Siracusa city.It is a very quite place and ideal for a relaxing holiday.It is near to state road 124 Siracusa-Floridia and 7 km(=3miles) far from the seaside and 3 km. 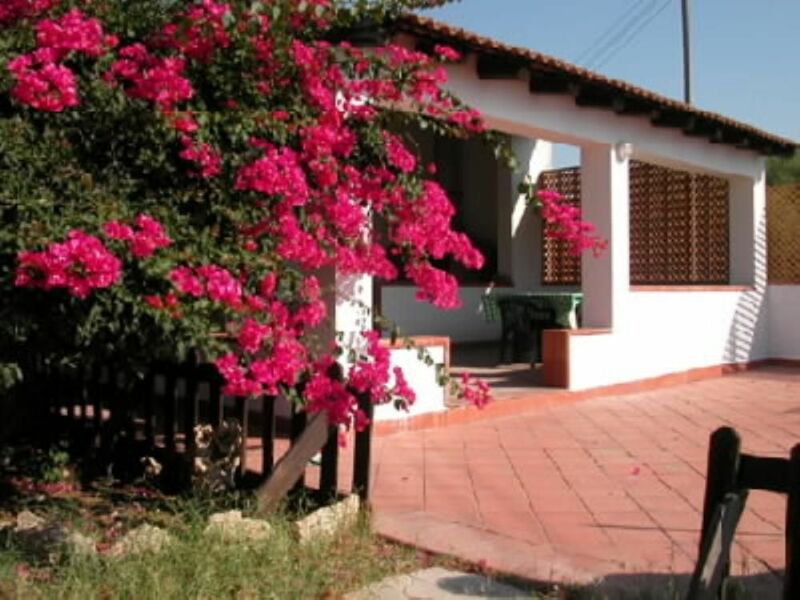 (1,5 miles) from the nearest town(that is Floridia),that 's why the car is necessary.The house is on two floors,composed of 3 bedrooms,2 bathrooms,1 kitchen,a wide terrace,a verandah all around the house and a parking place at the entrance.It is adapted for 4/6 people and all around the house is sorraunded by lemon tree,orange tree and other mediterranem trees,so it a very shaded place.The position of the house allow you to visit a lot of archelogical sites and cultural place :some cities very interesting to visit near the house are: SIRACUSA and its greek theatre.NOTO,that is the sicilian capital city of barocco.NECROPOLI OF PANTALICA,that is a prehistoric site of ancient habitans of Sicily .CASTELLO EURIALO,an ancient castle. The location of the property was excellent. Floridia is a gem of a town you need to explore and get to know. The people are so friendly, if you speak the language even better. Surprising entertainment overy a period of a week. Local clubs,gymnastics, dance,etc all on local show it was such a delight to watch and share with the local people. The food is simply the best food I have ever eaten. Our host Mauro and his father were a delight, so kind and very friendly. Everything is ok, guests friendly and kind, it was a real pleasure to welcome them. They have kept the places in perfect condition. Recommended. Mauro's villa is unique and delightful. Very secluded along a country lane of wild flowers. It is functional - fine really. Very clean and relatively easy to use. The outdoor kitchen area and facilities are great, as is the upstairs terrace for sunbathing - you can see the sea from there. Lovely wide covered terrace. It is a relaxed dwelling without any of the extra fussy bits and bobs. Some of the windows are quite high up, but all are usefully netted against flies and mosquitos. It is in a brilliant location and the fresh oranges and lemons are better than anything in the world! It was fun - with some quite unusual features. It is a house for relaxing. The garden/meadow area is magical with a wealth of wild flowers that seem to change overnight - quite extraordinary. Bright green lizards playfully pop up and stop taking in the scene of the new visitors before going about their business. Birds greet one in the morning with their playful chorus and the distant dogs keep in tune!! It is easy to get to other places as the SS124 is literally round the corner - but not obtrusive. The Roman Villa at Armerina is certainly worth a visit. So are Noto - icecream, Modica - chocolate, and Reserva Naturale Vendicari - birds and wild flowers. April is certainly a good time to visit this part of Sicily - there are still relatively few tourists and sea sides are unhampered by people so you can walk freely and just about dip your toes in the briny! There is a delightful blue and white beach café at Marina di Modica. One of the most wonderful sights is, as you come out of the doors at Siracusa airport and there in front of you is the smoking top of Mount Etna! What a tremendous experience! We were lucky with the weather - not a dull day for a week. So spring is a good time temperature wise and insect wise too. One last note - just down the road is the nearest supermarket - Pennymarket - it will serve you well for the basics and some pretty good bread if you choose wisely. Loved the area and this house, owner very helpful and welcoming. Very nice, friendly and smiling family, it was a pleasure to host it. He left the house in perfect condition. Super recommended. "This is a somewhat rustic house, with water fed by its own well and a casual design with a few unexpected touches, such as on-demand hot water. But it's easy to adapt to its few idiosyncrasies, and the reward is a very relaxing stay in a spot that's both isolated from the main stream of traffic (up a locked, private road) and convenient to all the sites in southeastern Sicily. You can hop in the car and be sitting at a restaurant in Ortigia less than fifteen minutes later. The closest houses are several hundred meters away, and the house sits roughly in the far corner of a grove of lemon, blood orange, and olive trees. The owner allowed us to pick all the oranges we wanted and we enjoyed fresh-squeezed juice every morning. There are two terraces for sun-bathing and a pleasant shaded area with a table and built-in benches for outdoor meals, card games, and just cooling off. The owner was extremely courteous and brought us several refills of wood so we could enjoy the indoor wooden stove. I went through hundreds of listings in the area before selecting this house, and can confirm that it is easily the best bargain to be found, as well as one of the best balances of tranquility and convenience we've ever experienced in a self-catering rental. We would stay there again. Grazie, Mauro!" Had a wonderfull 5 day in the villa. Absolute plus points for cleanliness, noise and facility of access. The remote location on the country side also provided a wonderfull all round view. Outside as well as inside there's a sense of spaciousness. "Très agréable maison située dans la fraicheur d'un verger. Equipement rustique correspondant au style de la maison. Accueil très chaleureux. (Text automatically translated) + CAR PLANE: Catania you can &#39;reach every day with Air One, Alitalia, Meridiana, Windjet, Lufthansa.Si can&#39; rent a car at the airport (HZ +39 095 341595). From Catania house is 50 km.